"Have suffered severe anxiety (panic disorder), depression and iron deficiency, as well as daily headaches and monthly migraines. Take antidepressants - mood and anxiety have improved now. Had a hysterectomy, iron is improved. I still suffer headaches daily - especially lately though for a while they were much improved. " It is common to find women who have Premenstrual Syndrome to have elevated tissue copper levels on the hair tissue mineral analysis (refer image left). Many women on oral and copper IUD contraceptives have elevated copper levels. Copper and zinc regulate the female hormones, estrogen and progesterone. An imbalance between copper, zinc, as well as the hormones, estrogen and progesterone are likely to be the chief culprits contributing to menstrual problems, including heavy bleeding. Symptoms of elevated copper echo PMS: Devastating frontal headaches, depression, fatigue, constipation, emotional volatility, weight gain and food cravings. The symptoms vary depending on the severity of copper toxicity. Contraceptive use, a severe viral infection, severe stress and disordered eating (anorexia, bulemia) may be causes of elevated copper, as can wearing of copper bracelets. Females may first suffer from copper toxicity with the onset of puberty when the female hormones surge. Copper toxicity may persist for many years and well after the causation has long gone. Copper is an elemental antagonist of iron. 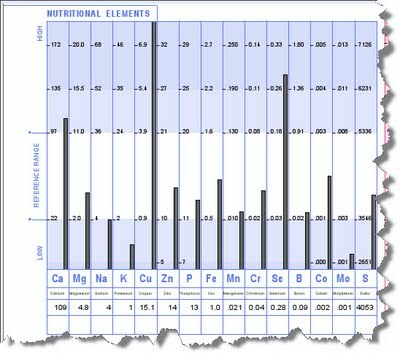 If copper is elevated then iron will tend to be low. Iron supplementation is usually a fruitless therapy for as long as copper levels are elevated. While a hysterectomy may relieve the symptoms of heavy bleeding, pain and fatigue, it does not address the underlying drivers of menstrual discomfort which may be elevated copper. If copper is elevated then the damage will continue, albeit with less obvious symptoms. The same can be said for the use of antidepressants to treat the symptoms of copper induced depression. Copper is an antagonist of potassium. 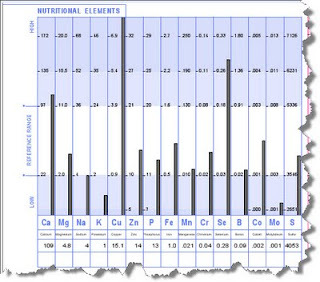 If copper is high, then potassium will tend to be low (Refer chart upper left). Low tissue potassium is associated with anxiety and panic attacks. Long term relief from migraines, panic attacks, depression and menstrual abnormalities can be found without resorting to powerful medications or surgery. Relief by natural means is not overnight and requires a lot of determination. Begin your journey by determining if there are any abnormalities with elements like copper, sodium and zinc and then setting about methodically correcting these. This is done with a Hair Tissue Mineral Analysis and making what changes are necessary to nutrition, lifestyle and taking dietary supplements.